Good Stuff NW: Mizuna by Any Other Name Would Taste As…Peppery? 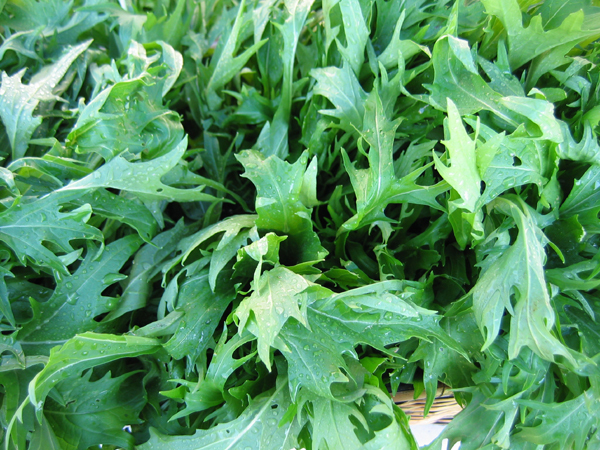 According to Wikipedia, "mizuna (Japanese: 水菜 'water greens')—also called shui cai, kyona, Japanese mustard, potherb mustard, Japanese greens, California peppergrass, and spider mustard—is a cultivated variety of Brassica rapa nipposinica. The name is also used for Brassica juncea var. japonica." What this definition doesn't tell you is that this mildly piquant, some call it "peppery," green is a vibrant addition to salads, soups, sautés, pastas and sauces. The deeply cut and fringed, almost feathery, leaves are so beautiful and their green color is so vibrant that I have a hard time passing them up when I see them appear in the early spring at my local farmers' market. I'd plucked a bunch from one farmer's heaping display one Saturday and a few evening later found myself in my usual state, realizing I had no idea what we were going to have for dinner that night. Remembering that bunch of mizuna waiting patiently in the vegetable bin, I breathed a sigh of relief. All I had to do was boil up a pot of pasta, chop some garlic, sundried tomatoes and walnuts, throw in a little Worcestershire and…voilà…dinner was on the table half an hour later. Success! While pasta is cooking, heat a large skillet over medium heat. Add olive oil and heat till it shimmers. 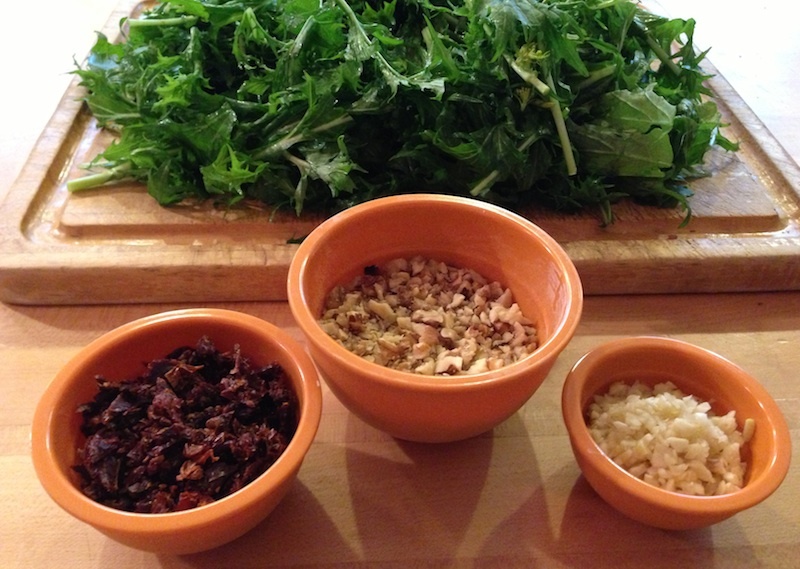 Add garlic and sauté briefly until it warms, then add walnuts, sundried tomatoes and mizuna. Sauté until mizuna wilts and add Worchestershire sauce and salt to taste. Remove from heat if pasta isn't done. 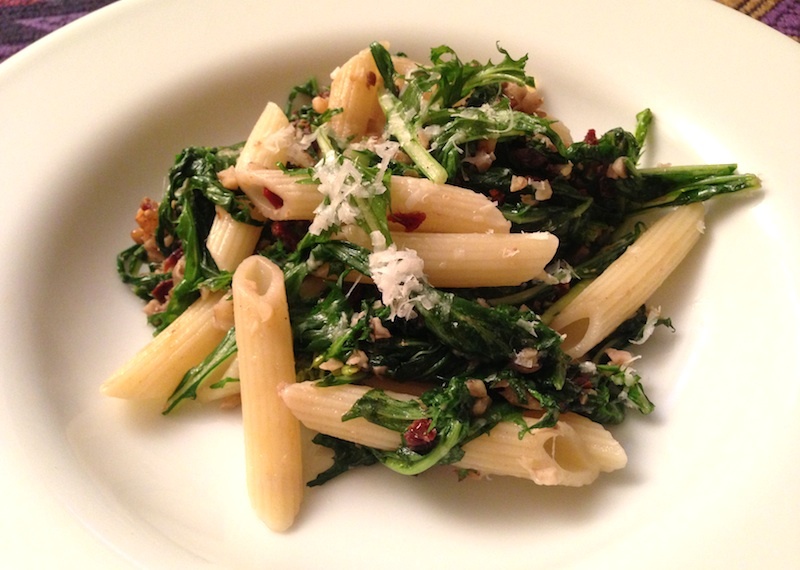 When pasta is drained, place in serving bowl and top with mizuna mixture, tossing to combine. Serve with parmesan for sprinkling.